August 26-MonsignorElias El-Hayek celebrated the first Maronite Liturgy at St. Francis of Assisi. 1973-First “roving reporter” and bulletin coordinator Muriel Mansour was appointed. September 23-Monsignor Elias El-Hayek officially became the first pastor of the new Maronite Mission. October-A dinner dance was held at St. Francis of Assisi to solicit pledges for the new church. October 7-The first baptism at Our Lady of Lebanon was held and Daniel Christopher Smithingell was baptized. November 4-Marty Rachid and Gloria Mansour organized the first religious education classed. December 2-Monsignor El-Hayek and Bishop Zayek celebrated a Pontifical Mass at St. Leo’s Church and Mayor Paul Visser presented the keys to the city to His Excellency. December 8-The first Maronite marriage was celebrated for David A. Shaw and Mary K. Rashid. 1973-The choir was organized by Anne Shaheen. 1973-Liturgies were held at Powers Catholic High School. January 7-The First Altar Society meeting was held at home of Marty and Nina Rachid. 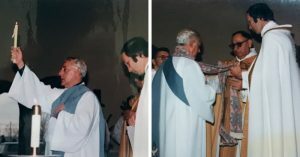 January 17-The first Maronite funeral was held for George S. Joseph. Early 1974-American Lebanese Morningstar Society purchased eight acres of land on Calkins Road. August 15-Father Ronald Beshara appointed to succeed Monsignor El-Hayek. August 26-Fr. Ronald Beshara and Bishop Francis Zayek concelebrated Mass for the Fist Anniversary of Our Lady of Lebanon at the place we called “The Pit”. 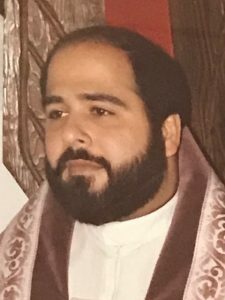 Bishop Zayek told the congregation on the first anniversary to resolve to go forward with the building of a permanent church and hall. September-Formation of Maronite Youth Organization (MYO). January-Deacon William Bartoul joins the parish family prior to ordination to the priesthood. February 2-Announcement of purchase of rectory and three acres of land with a pond. February 10-First St. Maron Feast Day Celebration. Spring-Our Lease expired at “The Pit” and we relocated to Dye Elementary School. June 23-Resoulution #183 was issued by the Michigan Senate.” the highest accolade be accorded to the parishioners of Our Lady of Lebanon…upon the occasion of ground breaking ceremonies for a permanent church building…as a token of the highest esteem in which they are held by this legislative body. 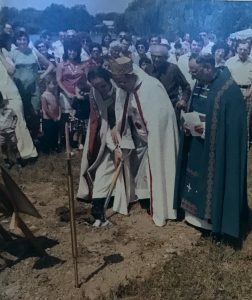 June 29-Bishop Francis Zayek presided over the Divine Liturgy and broke ground on the site of our new church and hall complex. June 29-Proclaimation issued by Mayor Paul Visser of Flint, proclaimed the week of June 29-July 5 as Our Lady of Lebanon Week. August-Development of directive for Mercy Meals. Autumn-We watched from Dye Elementary school as our long-awaited church complex began to rise fulfilling our dream. July 14-Special tribute issued by the House of Representatives…”to extend their sincere wishes for a most successful festival and for continued good fortune in the years ahead. July 16, 17 & 18-Proclaimed “Mid-East Festival Days” in Genesee County by Michael J. Carr, Chairman, Board of Commissioners, Genesee County, Michigan. July 16, 17, & 18-The First Mid-East Festival took place on the parish grounds. 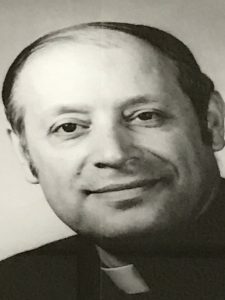 Co-Chairpersons were Michael Rizik and Norman Asher. The money from the festival was applied towards the mortgage. August 1-8-41st Eucharistic Congress was held in Philadelphia, PA. The choir from Our Lady of Lebanon and Powers Catholic High School sang the hymns during liturgy. This provided the inspiration to fashion our altar as a symbol of the chalice. November 20 & 21-Dedicaton of Our Lady of Lebanon Church and Sharbel Center. April 8-MYO presented a dramatization of the events of Good Friday. July 5-Proclamation issued by Mayor James Rutherford of Flint that the week of July 8th, be proclaimed the “Mid-East Festival Week”. July 8, 9, & 10-Second Mid-Eat Festival. August-Task Force was formed to define a “Declaration of Purpose”. It was to define our roots, journey and aspirations. October 9-Pope Paul VI Canonized St. Sharbel. Twenty parishioners journeyed to Rome. November 19-50th Anniversary celebration of the American Lebanese Morningstar Society. 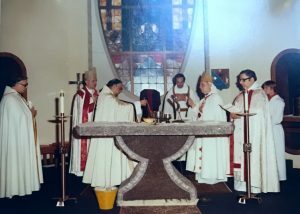 November 20-Charles Rossie ordained Sub-Deacon. December- “Declaration of Purpose” was presented to the parish. June 27-MYO prepares for rehearsal of Passion Play to be presented at NAM convention. July 14, 15, &16-Third Mid-East Festival. July 28, 29, & 30-15th Annual NAM Convention was held at Our Lady of Lebanon and Powers Catholic High School. Program included religious and social workshops, displays and activities for adults and youths. August 11-Youngtown and Flint held the First Teenage Encounter Youth Retreat at the barn near the Shrine in North Jackson, Ohio. This retreat was under the guidance of Father Dominic Ashkar and Father Ronald Bashara. This was the beginning of the annual gathering of Maronite youth (MYO) across the nation. August-Father Ron appointed Diocesan Chancellor. August 27-Parishioners gather for a picnic honoring Father Ron. August 30-Father David George became our third pastor. 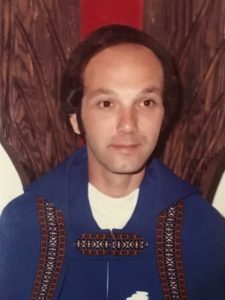 1978-Silver Massabki Medal awarded to Mr. Paul Koscielniak, music minister of Luke M. Powers Catholic High School and the NAM convention. July 10-Proclamation issued by John H. Trecha, Chairman of the Genesee County Road Commissioners, that the days of July 13, 14, & 15, be observed as “Mid-East Festival Days” in Genesee County. July 13, 14, & 15-Fourth Mid-East Festival. Fall-Fr. Dave initiates “Fireside chats”.